Windows 10 is now live, if you are eligible for a free upgrade, you will get a notification for the download soon. 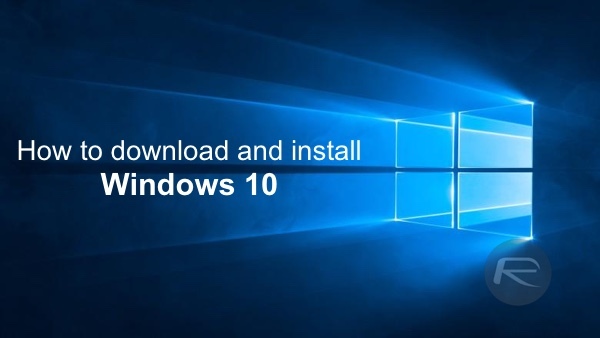 The following tutorial helps you download and install the free Windows 10 upgrade on your PC. You’re running genuine copy of either Windows 7 SP1 or Windows 8.1 Update. You backup all of your data to either a cloud service like OneDrive or locally on an external drive. Your PC meets Windows 10 minimum system requirements. You have already reserved your Windows 10 free upgrade. 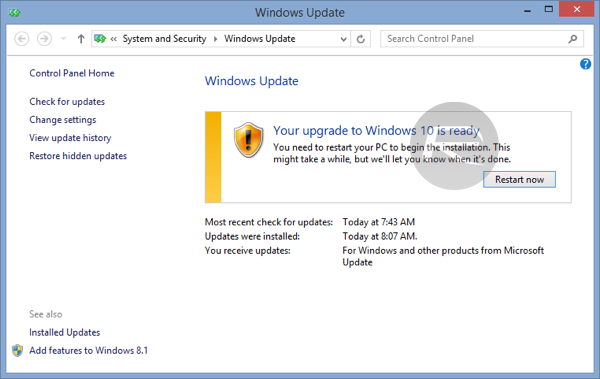 Step 1: Run Windows Update and see if your free reserved copy of Windows 10 is ready for install. It is important to note here that Microsoft is doing a phase rollout which means not everyone will get the update on day 1. If your Windows Update is showing you ‘We’ll let you know when the upgrade is ready to be installed on this PC.’ message, fret not, you can force it to download the update right now without any waiting time. 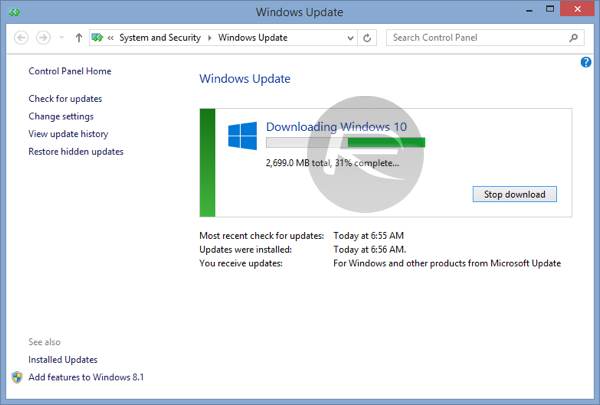 Follow the instructions here on how to do that: Force Download Windows 10 Free Upgrade Right Now, Here’s How [Tutorial]. 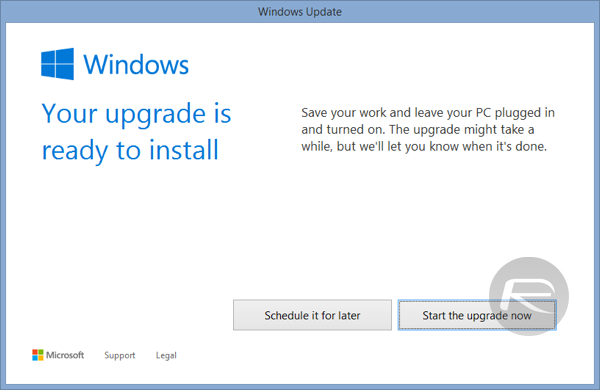 Step 2: When Windows Update is finished downloading Windows 10 update, you will get the following prompts. Either click on Restart now on Windows Update screen. or Start the upgrade now on this screen. Step 3: Your PC will now reboot, after which Windows 10 installation will automatically begin. The installation is divided into three phases: Copying files, Installing features and drivers, Configuring settings. You don’t need to do anything. Just wait patiently for it to do its thing. During the installation process, your computer may restart a couple of times. The duration of this process can take anywhere from 10 to 15 minutes, depending on the size of your data and speed of your computer. Step 4: Once the installation is complete, you will boot into this screen. Step 5: Now simply follow the on-screen instructions to get to the login screen. That’s it! You’re done! Happy Windows 10 day! I personally think it’s good, I like it and I will upgrade to Windows once available. Windows is now a service so Microsoft will continue improving it over time. But you’ll have a year to get the windows 10 upgrade before it will become a paid upgrade, so you can wait if you choose to do so. But I think it’s a improvement over windows 8.1. There might be bugs in the beginning but that will be flattened out in the next few weeks. The only thing I have a question about is, do Insider Preveiw users get the upgrade? Or is RTM it? 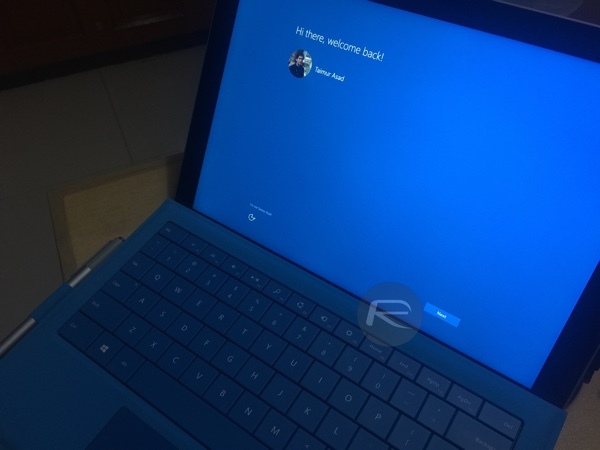 Insiders already got build 10240, which is the same build released this morning. Will it delete my files/programs? I am using windows 7 home premium. When I hit the command in cmd and go to windows update it says downloading 2 updates, that’s not the windows 10 update thing, help pls. 10-15min? It spent 4 hours for me! Yeah…but i cant do any of the customization features because it says im not activated on the insiders build. Did my whole update process through TeamViewer! I didn’t really expect the install to be successful! The files downloaded for me, but when I restarted, it booted up windows 8. I can still see the files in Windows bt and download folders. Is there anyway that I can proceed? I got my PC with genuine win 8.1. however, my internet is so slow, can I upgrade by using a Win 10 (ISO) file. i want to do a clean install, but not sure if the key of win 8.1 is valid on win 10. Same here- did you find a fix? Hello, guys I have a confusion, I am upgrading to windows 10 all I wanted to know is that either this upgrade will remove all my personal information and data in windows installation drive? Help me please. If you upgrade through Windows Update it will keep all your data and settings. Your Win8.1 key will work if you qualify for the free upgrade. Thank you so much for guidance and support. 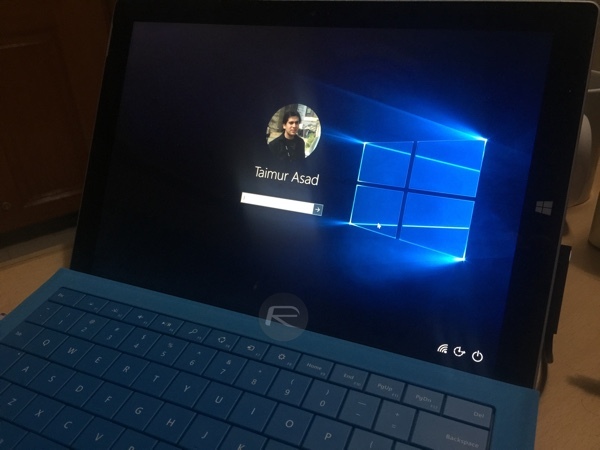 I have successfully install windows 10 by using this method, but here is some problem, my window is not activated and he ask me for product key after installation which i haven’t that’s why i was clicked “Do it later” option. When i am going to check from properties of my computer my windows is not activated. Please help me is there any way to activate my window. Waiting for your good response. Will the upgrade remove my settings. I am on a domain and have received the update notification, but will upgrading delete my domain settings and remove me from the domain? Same problem here, is there a fix already? .we have the same problem. they asking for product key and i don’t have.i reserved for windows 10 but i forgot to upgrade on time. is this possible that the one i reserved expired???? Carefull! with cheap unlｏcks and amateur unlｏcking teams. I only bought and unlｏcked my sons iphone 5S trough an online site, was great for nearly 2 months so no errors or anything but than suddenlyit was suddenly blocked by the provider. I was shocked by this I’ve attempted to factory unlｏck it with a different and better unlｏck team but it wasn’t possible once its locked back it’s not possible to unlｏck it again, they said. My friend claimed to unlｏck my phone at attiphoneunlｏcking. (cｏm) is reliable. Can you confirm this? just have found this info on facebook that many of the uｎｌｏｃｋ providers are giving realy not safe phone uｎｌｏｃｋing solutions which could make almos most of the phones to be locked back in an extremely little while of time. When you remove simlock your phone use a reliable uｎｌｏｃｋer like ATTIPHONEuｎｌｏｃｋING or official>iphoneuｎｌｏｃｋing. Hello everybody, here you are my windows 10 Pro product key,…I hope you enjoy it,…VK7JG-NPHTM-C97JM-9MPGT-3V66T,….good luck. If an error occurs preparation or download it when you turn on your PC back then it will repeat the preparation reinstall . so the need stable internet . This will take a long time so the use of the battery is not recommended , carried out outside the home or a public place is not recommended . You wait until you sleep and wake up again . and if windows 7 or 8.1 mu activate already . then ” No need key , serial number , activation back . If there is a difference win10 vs Pro because you know that they are paying for. If you use an activator keygen certainly is not as interesting as the original . I’ve been on step number 3. upgrading windows 10 but my PC shut down and when I turn it on, I lost the process. Do I have to download it again and wait so much time, AGAIN? Help please! How do I upgrade it now? I downloaded windows 10 but now my computer does not boot up to the desk top, instead the screen turns gray when it’s time to finish booting up. Downloading this upgrade takes an obscene amount of time. For me it took over 3 hours. If this is an upgrade, I much rather keep the old version. I much rather go back to Windows 7 than deal with a product that gives you grief before it’s usable!! 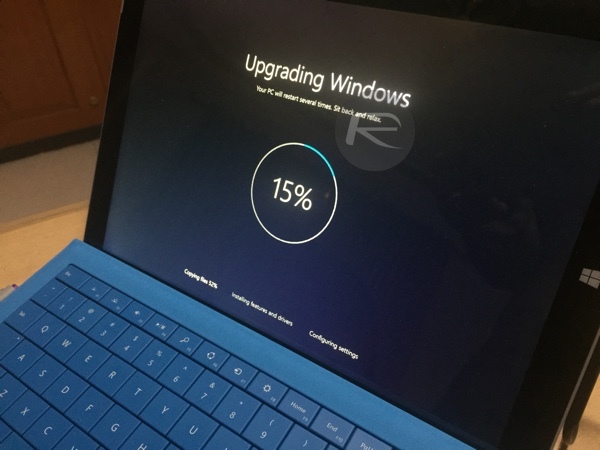 This has helped me in upgrading my already genuine Win 10 Home to Win 10 Pro Activated. You can search [microsoftkeystores .com]if you need. I already have windows 8.1 installed in my Sony VAIO Fit 15E. And Will I lose all my currently installed softwares if I upgrade to windows 10? And one more thing. Can I make a free bootable dvd instead of upgrading? u wont lose any personal data from the update. I was having issues than updated with win 10 and all my files were intact even the different playlist on Itunes. Hey, but is it possible the windows 10 to get installed by itself? For testing new OS, Re-installation of your new OS is very time consuming and destructive for your data, So I want to clear there is no doubt, As Windows 7 is the most recommended OS, Which through user can do almost all work without any problem, Where I recommend you to activate your OS being purchased its license code from ODosta Store, Which is distributing license for almost all types of Microsoft Products. I personally use it and have a good experience. I downloaded windows 10 on my pc. It was downloaded properly but when it restarted and tried to update it was ver very slow and suddenly the screen went off so i turned it off then it went back to loading but went off again what should i do? Files, pics, docs and personal info but not programs.. you will have to re-install programs.. Best case, record the program info [link, activation codes, etc.] into a doc then it won’t be difficult to re-install, just time consuming.